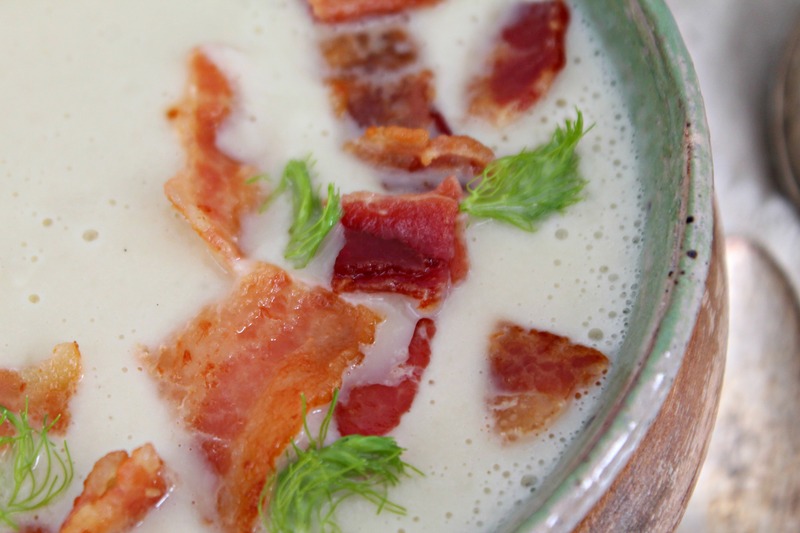 This Cauliflower & Fennel Soup with Bacon is just what you’re going to need in your soup repertoire – it’s creamy, comes together in under an hour, and is topped with bacon. What more could you ask for?! As most of you know, I’m a sous chef on Martha’s Vineyard. But before that, I’m also the pastry chef (hence my education in Baking and Pastry at the CIA). When my executive chef was recruiting, he was looking for “a cook that could do a little baking” and I replied to that with “I’m a baker that can do a little cooking!” on a handwritten thank you note that eventually got me the job. So you can say I do a little bit of both at my job and I love the balance of sweet and savory. But if you ask me what my favorite thing to make in the kitchen is, I’m quick to reply “soups!”. Every day, I start my day at work by making the soups of the day – sometimes one, but typically two soups. The process of cutting the vegetables, making the stock, sautéing and developing the flavors, adding the spices, seasoning and tasting, simmering until perfection – it all is so magical to me and one of my favorite things to do in the kitchen, both at the restaurant and at home. Recently, I was craving soup but had very little ingredients at home – but that’s the glorious thing about soup, you can make a delicious soup out of almost nothing! This Cauliflower & Fennel Soup with Bacon came forth as I noticed a sad bulb of fennel in the vegetable drawer, a bag of frozen cauliflower, and some limp celery. Add to that some homemade stock in a mason jar and half a quart of store bought stock in the fridge, and we were ready to make soup! This soup says to cook for 30 minutes, but if you have the time, sauté the vegetable an extra ten minutes over low heat and simmer the soup for a few extra minutes as well. Soup benefits from the extra cooking time, so you’ll rarely see a 15-minute soup on my blog – I think flavor development and coaxing of flavors is quite important in this process – plus, soup just shouldn’t be rushed in my opinion! 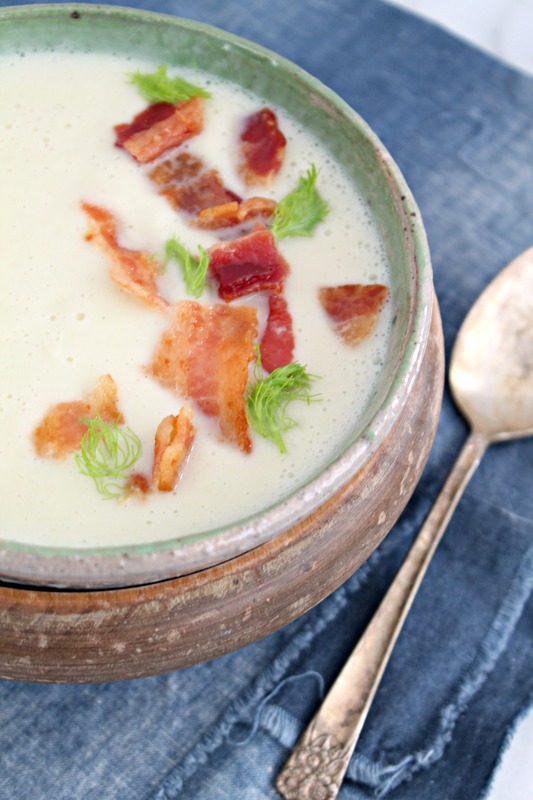 Here’s to hoping you can have a taste of this Cauliflower & Fennel Soup with Bacon soon enough! This Cauliflower & Fennel Soup with Bacon is quick to make (use frozen cauliflower for an even quicker recipe!) and flavorful, perfect for the fall season! In a large stock pot, sauce the onion, celery, fennel and cauliflower for about 10 minutes. Add the chicken stock, reduce heat to low and simmer for 30 minutes. Remove the bay leaves, add cream and butter. Season with salt and pepper. In a blender or using an immersion blender, puree until smooth. Adjust seasoning and serve hot, with bacon and extra fennel fronds on top. You say “soup out of almost nothing at all” and now I have that song “love out of nothing at all” in my head! But that’s kind of what soup is, too! This looks delicious–what a great warmer for the cold weather ahead!